Providing you the best range of sterile cabinets, sterile storage cabinets and sterile garment cabinets with effective & timely delivery. Clean air™ makes garment storage cabinets provide the premium solution to meet your garment storage needs while making a positive contribution to maintaining the cleanliness of your controlled cleanroom environment. Cleanroom garments can accumulate particulate contamination during storage and between laundry washes, which in turn may lead to lower product yields and increased product quality issues. These garment storage cabinets are equipped with a blower and a HEPA filter in a fully contained enclosure constructed of powder-coated steel sheets, which will not shed particles or contaminate the environment of your clean room. 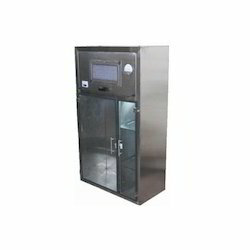 they provide a solution for storing your clean room garments in a visible and organized manner, while at the same time removing particulate contamination from your garments as they are stored and removed. Cleanair™ makes garment storage cabinets provide the premium solution to meet your garment storage needs while making a positive contribution to maintaining the cleanliness of your controlled clean room environment. Clean room garments can accumulate particulate contamination during storage and between laundry washes, which in turn may lead to lower product yields and increased product quality issues. these garment storage cabinets are equipped with a blower and a HEPA filter in a fully contained enclosure constructed of powder-coated steel sheets, which will not shed particles or contaminate the environment of your clean room. 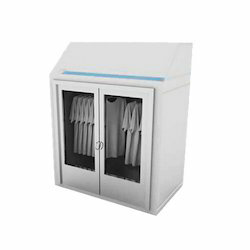 they provide a solution for storing your clean room garments in a visible and organized manner, while at the same time removing particulate contamination from your garments as they are stored and removed. 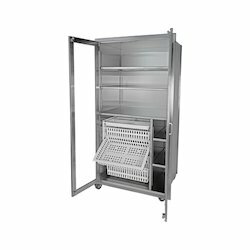 Looking for Sterile Garment Cabinets ?